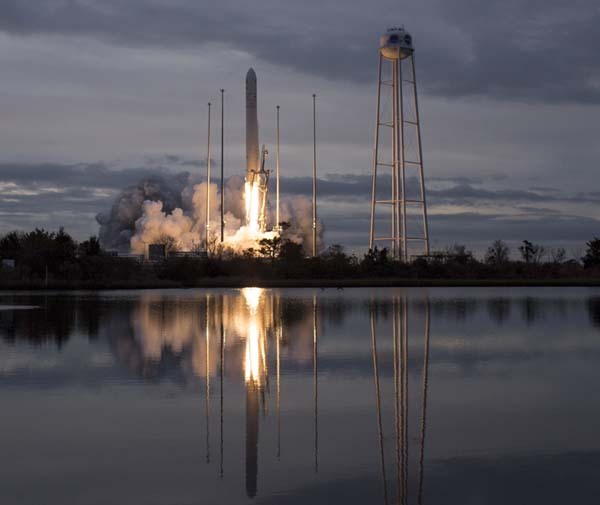 DULLES, Virginia, 12 November 2017 (Orbital ATK PR) -– Orbital ATK (NYSE: OA), a global leader in aerospace and defense technologies, successfully launched its AntaresTM rocket carrying a CygnusTM spacecraft today at 7:19 a.m. EST, from NASA’s Wallops Flight Facility in Wallops Island, Virginia. The launch is Orbital ATK’s eighth cargo delivery mission to the International Space Station for NASA. During the mission, designated OA-8, Cygnus will deliver vital equipment, supplies and experiments to the astronauts aboard the space station, as well as conduct scientific experiments onboard Cygnus while docked with the orbiting laboratory. I guess. They are sending a carbon segment for fit checks to KSC. If it is 2 half segments, nozzle and cap,to make a 1 segment rocket I could see some fit checks. Like the launch mount. I don’t see how a middle segment could do much fitting. Maybe some shipping, lifting, stacking checks. Word salad, sir. In future, try to actually explain what you are on about as the rest of us don’t have access to the voices in your head.